Well, it seems even Peter Costello cannot stomach the nonsense that emerges from the alegedly prophetic mouth of Pastor Danny Nalliah. It seems that on this occasion Nalliah has just gone too far. It wasn't bad enough for Nalliah to call on his flock to pray to God that Hindu and masonic temples (not to mention mosques) be torn down. It wasn't enough for Nalliah to meet with the moronically anti-Semitic League of Rights. It wsn't enough for Nalliah to argue that domestic violence shouldn't be grounds for a Christian divorce. None of this was enough for Costello to condemn Nalliah. None of this was enough for Costello to stop sending Australia Day messages to Nalliah's cult. 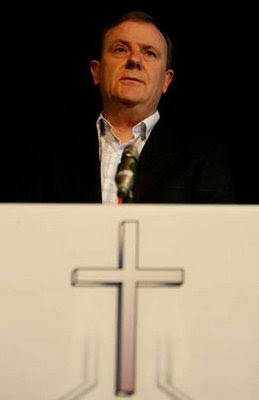 While other clergy at the heart of the tragedy were expressing more restrained and heart-felt emotion, Peter Costello's favourite pastor was lecturing Victorian bushfire victims about how the flams represented divine punishment for supporting abortion. CTFM leader, Pastor Danny Nalliah said ... he was not surprised by the bush fires due to a dream he had last October relating to consequences of the abortion laws passed in Victoria. He said these bushfires have come as a result of the incendiary abortion laws which decimate life in the womb. Asked by the Herald if he did not believe most Australians would regard his remarks as being in appallingly bad taste, he said today: "I must tell people what they need to hear, not what they want to hear." He said it was no use "molly-coddling" Australians. Asked if he believed in a God who would take vengeance by killing so many people indiscriminately - even those who opposed abortion, Mr Nalliah referred to 2 Chronicles 7:14 to vouch for his assertion that God could withdraw his protection from a nation. "The Bible is very clear," he said. "If you walk out of God's protection and turn your back on Him, you are an open target for the devil to destroy." In the New King James version of the Bible, 2 Chronicles 7:14 states that: "If My people who are called by My name will humble themselves, and pray and seek My face, and turn from their wicked ways, then I will hear from heaven, and will forgive their sin and heal their land." Still, don't be surprised if, come Easter or Christmas or next year's Australia Day, Costello again sends Nalliah a special videotaped message. UPDATE I: I spoke to someone at the Herald Sun. I was curious if they would run anything on the latest Nalliah stupidity. The Herald Sun chap told me that they are too busy running sensible stuff about the fires. Fair enough? Then again, even Andrew Bolt refused to use his blog to spread "fire jihad" conspiracy theories.